Dozens of fans packed the White Sox stadium Tuesday to watch their team’s season opener against the Detroit Tigers, their division rivals. The White Sox and Tigers were scheduled to start their seasons yesterday, when MLB had 12 games scheduled for its ceremonial Opening Day (three games were played on Sunday). Alas, the weather on the South Side refused to cooperate with baseball’s plans, and the game was moved to Tuesday. 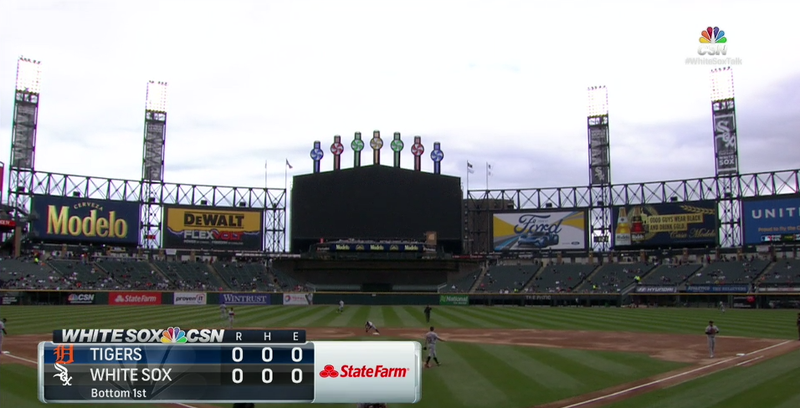 Before Monday’s scheduled game was postponed, the White Sox hoped to find a window to get the game in, but after about an hour and a half of everyone waiting around, the game was finally called. The stands at the recently renamed stadium the White Sox play in were packed for the team’s first game, despite the drizzling rain and lack of players with qualifying major league playing time on the home team’s roster. Tickets for yesterday’s scheduled game were honored for the makeup game that began at 1:10 p.m. CT. It was an unfortunate turn of events for the White Sox, as asking fans to show up for a Tuesday afternoon game in 49-degree weather after many of them had likely taken off Monday for work was a tough sell. Announced paid attendance for today will likely reflect the tickets sold for yesterday’s game. At the time of this writing, the White Sox were down 5-1 to the Tigers after Jose Quintana allowed home runs to JaCoby Jones and Nick Castellanos in the second inning.